The smell of fresh cider is in the air, twisting corn mazes await exploration, and bright orange pumpkins wait to be picked. In Ohio, we take our pumpkins seriously. Mini pumpkins, white pumpkins, fairytale pumpkins…whichever you prefer, there’s a variety ripe and ready to pick in Ohio! So head to the farm, grab a wagon, and enjoy the best pumpkin picking spots in the state. Plan your next family get together, group outing or school field trip with pumpkin picking at the Lohstroh Family Farm! The farm has been in business since 1982 and offers a fun farm experience for families of all sizes and ages. They grow corn, soybeans, wheat, hay and pumpkins, and also have an assortment of cattle as well. Take a covered old fashion wagon ride to the pumpkin field where you can choose own pumpkin. What was originally a hobby has blossomed into a must-see for anyone visiting the Albany area. Libby’s Pumpkin Patch features a three-acre pumpkin patch filled with a multitude of pumpkins to choose from, each grown using sustainable farming techniques. Selections include 20-30-pound carving pumpkins (Apogee), pie pumpkins (Mystic Plus), and cute, decorative mini pumpkins (Lil Pump Ke Mon or Crunchkin). While you’re there, be sure to try some of Libby’s delicious pumpkin ice cream, made from scratch in an actual ice cream maker! Spend the day getting some fresh air and having fun with the family at Leeds Farm in Ostrander, Ohio! Marvel at the wide selection of pumpkins available, including blue pumpkins, white pumpkins, mini pumpkins, the Galeaux d’Eysines and the giant fairytale pumpkins! Whether you’re in search of the perfect jack-o’-lantern for carving or a fun sized pumpkin for the little ones, Leeds Farm has a pumpkin for everyone. Tom’s Maze and Pumpkin Farm has been in business for over 20 years and their goal is to be the most unique, fun-filled outdoor activity in southwestern Ohio. While they are well-known for their creative corn maze patterns, boasting a new one each year, they are also known for their selection of pumpkins. The farm grows more than 50 different pumpkins and squash, including Cinderella pumpkins, striped pumpkins, and even pastel colored pumpkins! If you want to do something more creative (and fun) with your pumpkin, try the Punkin’ Chunkin’ Cannon and see how far your pumpkin will fly! Fall season begins at the end of September for the Honey Haven Farm in Ashland, Ohio. In the beginning it was a working dairy farm but in 2003 the family decided to raise gorgeous Percheron horses and small cow-calf beef instead as well as other crops such as wheat, soybeans, and pumpkins. Take a horse-drawn wagon ride through the field to pick one of their glorious pumpkins and if you’re feeling adventurous afterward, test your strength and the weight of your pumpkin by using one of their four pumpkin slingshots or one of their three air powered corn cannons. Home to the county’s finest homegrown pumpkins is Jason’s Pumpkin Patch, located in Oak Harbor. The patch features over 100 varieties of pumpkins, gourds and squash. Pumpkin selections include carving pumpkins, specialty pumpkins such as white, fairytale and Kakai, as well as giant pumpkins that weigh up to 300 pounds and come in colors such as white, green and pink! They also have hand painted pumpkins available for decoration. Take a tour of the farm on one of their hayrides and see where the pumpkins are grown before selecting your own! Monroe’s Orchard has been in business since late 1938 and is now in its third generation of operation. The orchard has a variety of fruits including apples, peaches, pears, strawberries and more. They also have a large selection of pick your own pumpkins as well. Monroe’s is a delicious place to be so come and make some memories this fall season! This farm has 370 acres of fresh air, room to roam and play, fishing ponds, woodland trails, trees, hay fields…and pumpkins. Lots of pumpkins! At Bonnybrook Farms in Clarksville, the motto is “a day in the country is worth a month in town.” This is the best place in Ohio for a weekend escape or an all-day outing with family and friends. Join them at the end of October for the 5K Pumpkin Trail Run/Walk. 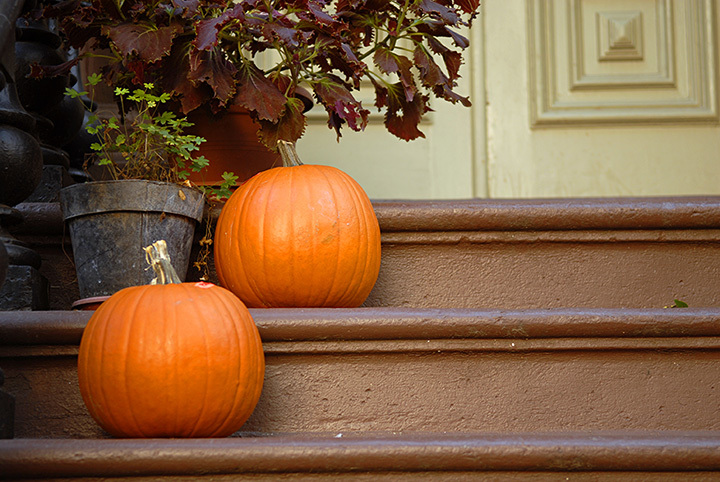 If you think your pumpkin will look good as decoration, try carrying it with you throughout your run or walk! Shaw Farms has been family owned and operated since 1807, when Thomas and Martha Shaw immigrated to Ohio from Pennsylvania. It wasn’t until 1952 that they decided to raise pumpkins in addition to sweet corn and since 1970, the pumpkins have continued to grow, as has the farm. It’s now a third generation operation and has been giving families a quality place to go for pumpkins ever since. Join them in mid-September for their Fall Festival and bring the whole family to find the next Great Pumpkin! Come join in the fun beginning in mid-September! At Kingsway Pumpkin Farm, enjoy activities including the corn maze, petting zoo, straw tunnel and corn slides, and more. To get to the pumpkin patch, you’ll take a relaxing hayride that will allow you to take in the sights and sounds of the farm while breathing in the fresh fall air before finding that perfect munchkin or Cinderella.